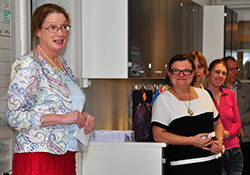 The opening of the brand new Clinical Health Promotion Centre, a collaboration between Nordic research institutions, was celebrated on 18 November 2011 at Bispebjerg University Hospital, Copenhagen, Denmark. The new centre will strengthen global clinical research and development in five key areas: alcohol/drugs, tobacco, nutrition, physical activity and comorbidity. The centre is a merger between the existing Danish WHO Collaborating Centre for Evidence-Based Health Promotion in Hospitals and Health Services and the Swedish Clinical Alcohol Research Unit at Lund University. Dr Maria Ruseva, Programme Manager for Public Health Services, WHO/Europe, expressed her great satisfaction with the Centre’s work in disseminating clinical health promotion research and development worldwide. She also emphasized the importance of WHO’s close collaboration with the Centre. producing the newly established scientific journal Clinical Health Promotion – Research and Best Practice for patients, staff and community. The Clinical Health Promotion Centre has more than 28 staff, including 9 postdoctoral researchers and 7 PhD students. The Centre’s Danish offices are located at Bispebjerg University Hospital in Copenhagen, while its Swedish offices are located at Skåne University Hospital, Malmö.